It's been exactly 2 months now since I last posted in this now-updated blog. 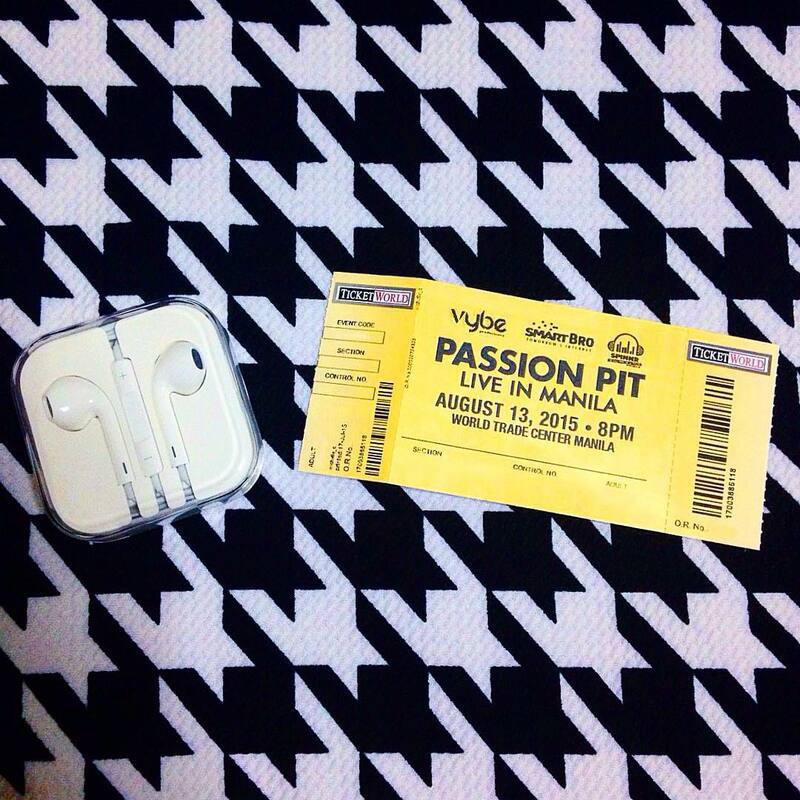 So for my "comeback" post (LOL), let's talk about the band Passion Pit. I don't know about you if you haven't even heard of the song "Carried Away" or "Take A Walk" in your entire life. But for the past weeks, it's been part of my playlist in preparation for the band's first ever concert here in the Philippines, that was supposed to happen on August 13, 2015, at the World Trade Center in Pasay City. This then sent fans to a frenzy on social media: Facebook, Twitter, and Instagram (including me, since I recently just upgraded from Silver to VIP Seating). Passion Pit even trended the night the sad news was announced! Just in case you were one of those people wondering who they are, Passion Pit is an indie electronica band that originated from Cambridge, Massachusetts in 2007. The band consists solely of Michael Angelakos--the man behind that high pitched (falsetto) voice most people always thought was a girl; and joined live by his crew: Chris Hartz (drums), Aaron Harrison Folb (bass/synthesizers), Giuliano Pizzulo (guitar/synthesizers), Pete Cafarella (synthesizers) and Ray Suen (guitar/synthesizers). With the release of Passion Pit's debut album, most of the songs were picked up for media campaigns and advertisements. That's when the band slowly created a niche in the music industry. Campaigns and advertisements kept on coming and the band started touring. However, in 2012, the band canceled the remainder of its July performances. It was then announced in a blog post from the band's official website that Michael Angelakos, lead singer, said, "I am going to take the time to work on improving my mental health.". Michael was diagnosed with bipolar since he was 17 and had been receiving therapy, hospital care, and medication ever since. Two days later, it was revealed that Michael was on suicide watch. On March 4, 2013, it was reported that Michael has been recovering and was set to perform at Madison Square Garden--which was sold out, by the way. 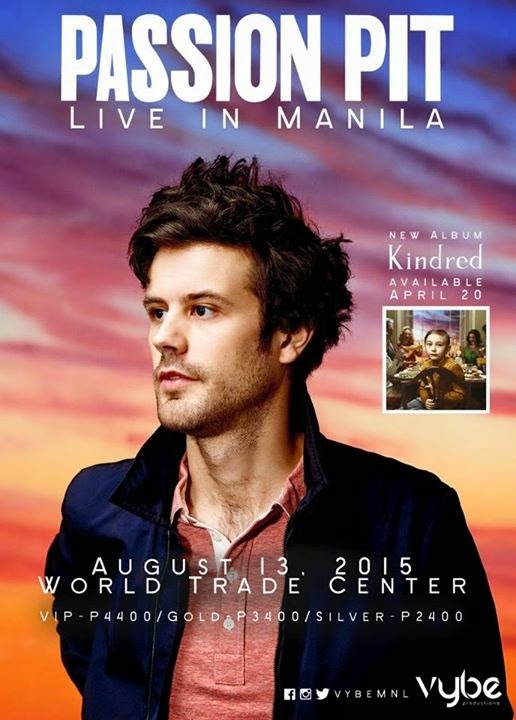 Fast forward to 2015, Passion Pit has released a new album "Kindred" with a more positive sound and lyrics to it. The song "Lifted Up (1985)" by the way, is about Michael's wife (sorry, girls), Kristy Mucci, being there for the hard times. I even read somewhere that it was Kristy who saved Michael from committing suicide. Thank God, Kristy. And oh, FYI--1985 was Kristy's birth year. And now that many fans and followers of Michael Angelakos and Passion Pit were really upset with the cancellation of all his upcoming shows, we could really use some happy thoughts and music, right? Here are my Top 10 Passion Pit songs to cheer me as well as other Passion Pit fans out there. Don't let your worries ruin your day"
I swear there's truth in that"
The Sun's got a smile 'cross the face"
Don't call me crazy, I'm happy"
So find a place as this forever divine"
I put my hands in the air and my knees to the ground, yeah"
higher and higher and higher"
Take a walk, take a walk, take a walk, (oh-ah-ohhhh)"
Always let it get to my head"